Tuck in a disposable insert and baby is good to go. 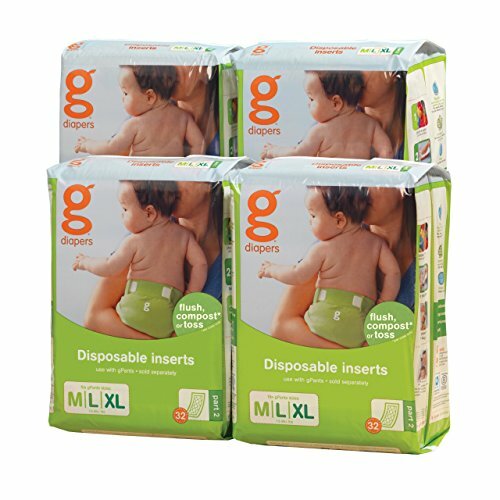 gDiapers is reinventing the diaper inside and out, giving parents the convenience of disposables and the confidence to build a better future. On the inside, our Disposable Inserts are Cradle to Cradle Certified(cm) Silver, flushable and break down in home compost (wet ones only). On the outside, our soft cotton gPants diaper covers let baby’s skin breathe and come in colors and prints that fit your style. Every time a conventional disposable diaper is changed it gets thrown in the garbage. That’s over 27 billion diapers that head to US landfills every year. Every time you change a gDiaper, you have a choice. You don’t have to throw it all away. You can choose to turn your waste into a resource by composting our Cradle to Cradle Certified(cm) Silver Disposable Inserts (wet ones only). Or you can flush the Disposable Insert down the toilet, following the directions on the packaging of course. Your baby’s bottom will feel good in our soft cotton gPants diaper covers that are designed to maximize airflow and minimize diaper rash. And you’ll feel good having your baby in colors and prints that fit your style. gPants anatomy, inside and out. 1. Pick your gPants. Any color will do. 2. Tuck in an insert. 3. Change your baby. Hug. gPants come in sizes from newborn to extra large to fit your child perfectly from the moment they arrive in the world right until they are walking and talking toddlers ready to potty train. 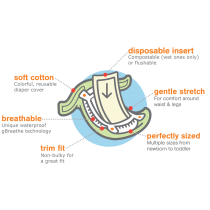 Disposable inserts come in 2 sizes — newborn/small and medium/large/XL — and are designed to fit snugly inside the gPants. gPants and disposable inserts make a great pair. All you need to use gDiapers are inserts and gPants. If your baby is on the way, the Newborn Bundle is the perfect place to start. It has just what you need to get going with gDiapers for a brand new baby. If your baby is already here and bigger than the newborn size, we recommend 6-8 gPants in each size. You can buy them individually to hand-pick the colors or prints that you want, or you can choose a bundle for extra convenience. gDiapers, like any diaper, need to be changed every 2-4 hours. Our newborn/small inserts come in packages of 40; medium/large/XL come in packages of 32. Buy them by the case (4-pack) to stock up and save money.